Origami is an ancient traditional Japanese art of transforming paper sheet into a unique sculpture. 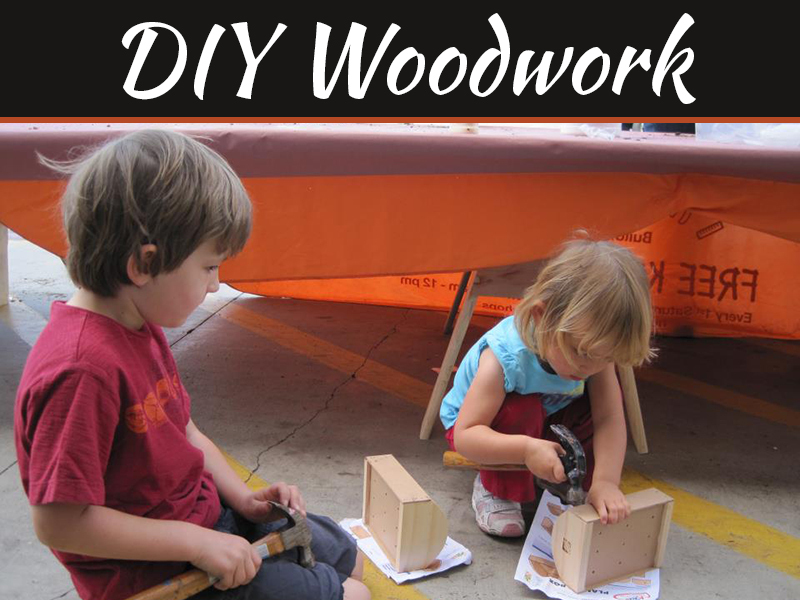 Before it was limited only into creating paper crafts but in modern days it is also being used for different purposes. 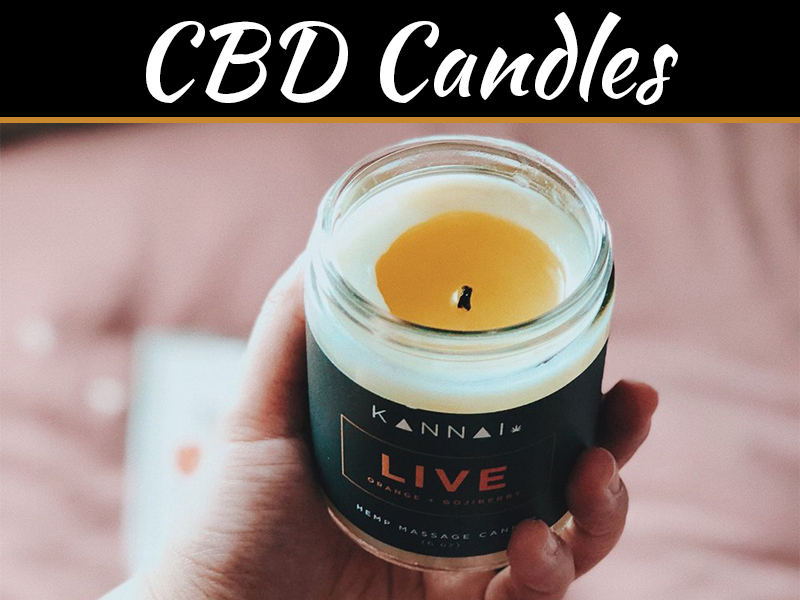 In this post I will be featuring a larger perspective where it is used in interior decoration as an excellent way of creating personalized and creative spaces at your office or even at home. We find some cool ideas of creating sculpture and artful origami allure; there are so many possibilities from the simplest decorations made from paper to lighting, wallpapers, accessories, and pieces of furniture, anything in your imagination. 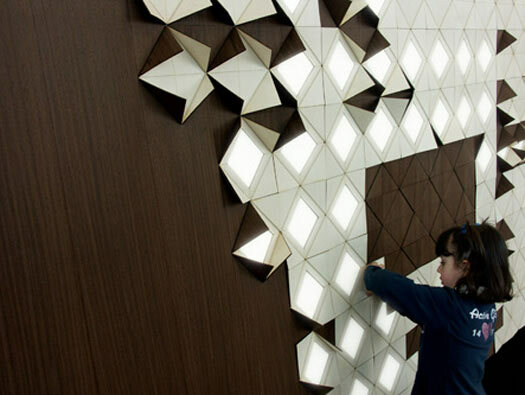 The origami-inspired style would definitely complement any modern artistic interior design. Ordinary products get an appealing look by adding a bit of creativity with origami shape. Its clean, simple and visually interesting shape enables the designer to think out of the box and create artistic products incorporating with their imagination. People are more attracted to sleek, distinctive and light weight design. Thus, its light weight materials bend and fold to form modern, elegant and surprisingly comfortable decorating elements make it handy and attractive. In case of designing a house the first thing that comes in mind is enough lightening source in the house. If you have a modern house and want to add an artistic yet attractive lightening, then I got a very useful idea that you can try on. The given picture is an Expansion of the Japanese art concept by Francesca Rogers and Daniele Gualeni. 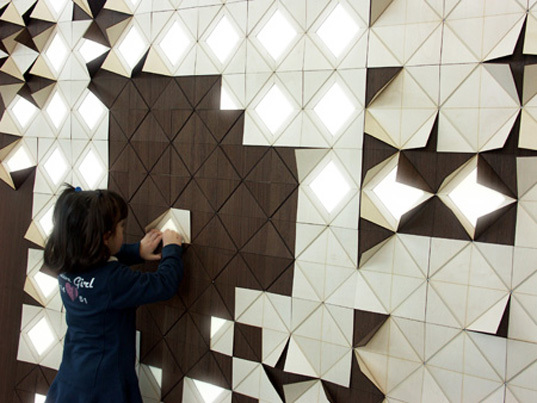 They created a modular lighting system with wood panels that can be flipped back to expose energy-efficient electroluminescent lights. IT can be affixed to any wall by creating luminous mosaic to balance modern design with a grand nod to traditional Japanese art. 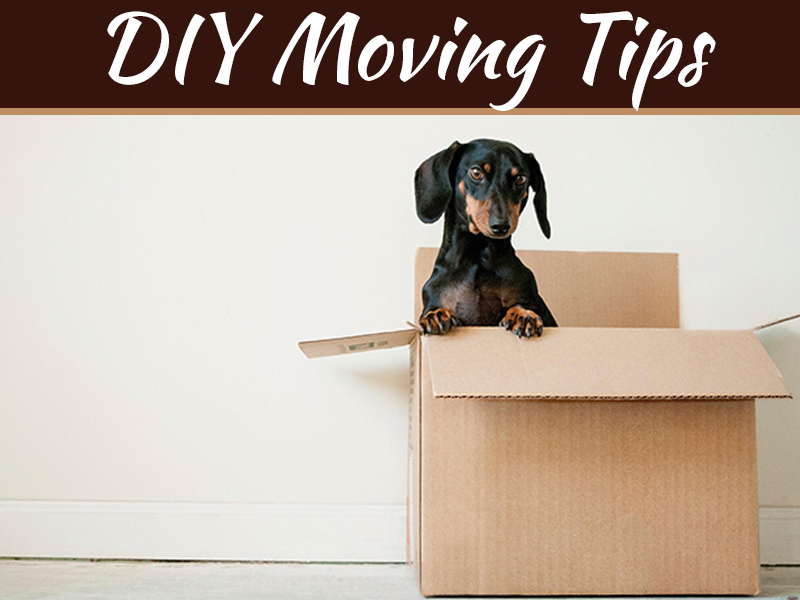 Your house will be beautiful if you can select appropriate furniture for your house. There are some modern allure furniture pieces inspired by origami design that are more attractive and portable than heavy ones. This awesome folding chair is made by Gregg Fisherman out of a single board. 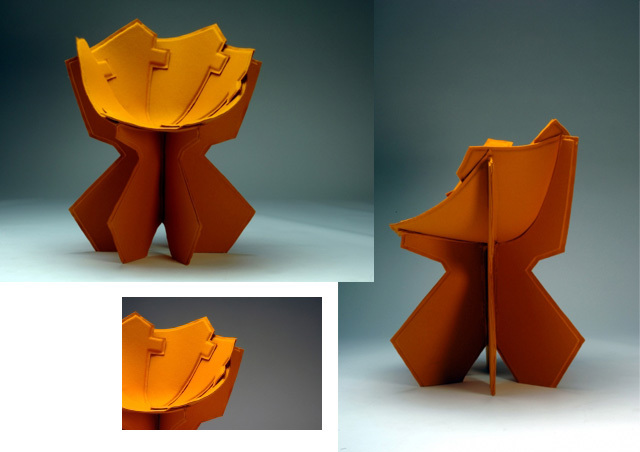 It might look like a paper blossom but it is a modern folding chair that can easily be moved without too much effort. 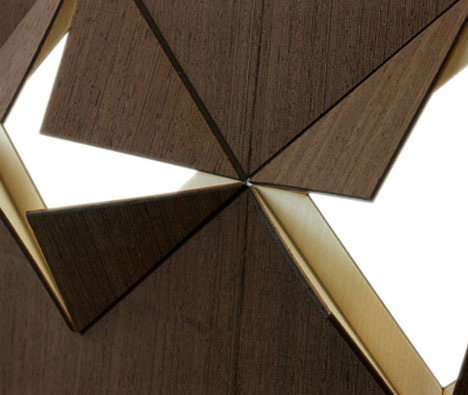 One of the most interesting parts of origami inspired furniture is its simple but stylish items. 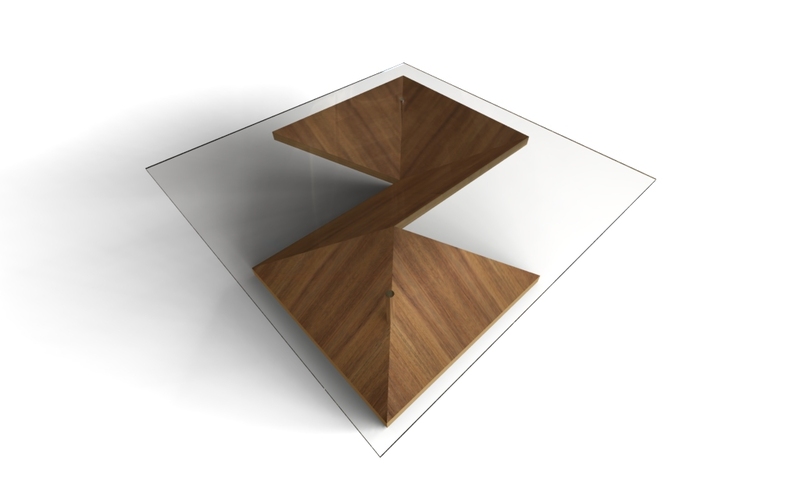 This table is an example of simple but stylish origami furniture. It is a curtain shade made by Florian Kräutli. This curtain has magnets sewn with the fabric which make it possible to move it in any angle. This concept can make any unique creation. Hope these ideas made you more inspired to use or even create more unique origami inspired items. Where are the lights (first image) sourced from please?